It is true that each and every dog is unique in their own way. Shih Tzu puppies are no exception. This breed is undeniably beautiful and each one is adorable and endearing in their own way. What can be said about these puppies is that they have the temperament and disposition to be excellent therapy dogs. If you’ve come to our site or store searching specifically for Shih Tzu puppies for sale to train as a therapy dog, then you’ve come to the right place. 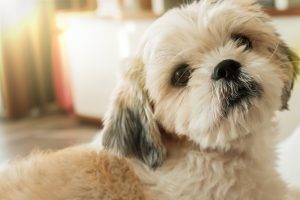 Before you make your decision, take a look at three qualities of great therapy dogs and if your Shih Tzu puppies fit the bill. In order for Shih Tzu puppies to transition into working as a therapy dog, the dog must have an overall happy outlook towards each person that they encounter, no matter the circumstance or situation. Some dogs are super duper loving and sweet with their owners but are shy and standoffish with strangers. The latter won’t be good for therapy dogs. They need to be almost overly friendly but in a controlled manner. Along the lines of being genuinely affectionate, Shih Tzu puppies need to be calm and cheerful at all times. In order to achieve success as a working therapy dog, they need to have temperaments that allow them to flow in various situations and not really be affected by the change of scenery. They’re cool as a pickle, always. When they meet new people, they can not be overly excited or jump, and certainly not bark. They should be able to handle phones ringing or hospital buzzers buzzing and not be fazed by the sounds. This is one of the most obvious but it must be stated. In the beginning, the Shih Tzu puppies for sale that you purchased was naturally untrained. Once in your care, if your goal is to have a therapy dog, your pup must be obedient. It must be able to follow commands easily and willingly.